There’s a lot to say lately. And way, way more to listen to. And in the middle of all the listening and the saying and the thinking and the doing, other parts of life keep moving. Maybe one of your sisters has a baby and you spend at least 20 minutes every day scrolling through pictures of her because she is the cutest baby in the world. Undeniably. The strongest, too. And maybe your job feels extra important now, because it’s teaching you confidence and clarity every minute of every day – and these are things you’ll need if you want to fix problems and change worlds. And maybe part of that job involves a heckuva lot of travel. And thus – this post. A list of tips and tricks for staying healthy and sane while traveling. Particularly on those one-to-three day adventures, when you never fully settle in. Because whether you’re poised for a holiday immersion or a few last-minute work trips before the year ends, it never hurts to feel more like yourself. Sleeping poorly is common “on the road.” But it can be mitigated with a little attention-paying. So, before you go to bed (and – you know – before you’ve actually left home), notice how you wind down. Do you wear cozy socks? Do you floss? (Please say yes.) Do you turn on a fan or humidifier? Do you read a couple pages of a Mary Higgins Clark murder mystery? Do you talk “roses and thorns” with your spouse or kids? Pick a couple of key habits or rituals, and pack accordingly. Every night after I brush my teeth, I put a dab of Vaseline on my lips. (Is that weird? I’m not up to speed on the benefits of petroleum jelly.) When traveling, I used to sub whatever lip balm or Chapstick I could dig out of my backpack, but it’s just not the same. So now I pack a teeny tiny travel-size Vaseline in with my toothbrush. It’s not much, but it makes a huge difference. When I’m at home, I also sleep with a fan running on low every night. I live in the city, and it helps dull the chatter of the after-bar crowd and the early-morning dog walkers. Hotels (and other people’s houses) are filled with a strange lack of noise. So I downloaded a free app that consists of eight hours of nothing but fan. On the road, I click it on every night and sleep like a baby. Sometimes, stress-free traveling requires more than just pretending you’re at home. What’s a realistic but luxurious self-care ritual you usually skip at home and could easily do on the road? Maybe it’s a foot massage with that eucalyptus lotion someone gave you for your birthday. Or it’s using the expensive lavender wrinkle cream you definitely don’t need, but have 15 samples of anyway. Especially if it’s a sample size, extra lotions or essential oils are easy to travel with. My personal travel ritual consists of dabbing a drop of pure peppermint oil in the center of my palms, rubbing my palms together, and then gently massaging the peppermint on the base of my neck and upper shoulders every morning. Before I rinse the oil off my palms, I also vigorously rub them together and take a nice, deep inhale of the peppermint aroma. It’s refreshing and rejuvenating, especially when my body clock thinks it’s 4:30am, regardless of the actual time zone. Lay off the booze and sugar. And while you’re at it, find the veggies. I know! Blasphemy! I’m not saying you have to skip cocktails and dessert entirely. But if you get knocked off your game by a couple of plane rides, weird-smelling Ubers, and/or a hotel shower that just. won’t. drain., do yourself a favor and try not to tax your system even further. No travel tip blog is complete without this one. But if it’s an overwhelming thought, just start simple. A 15-minute walk around the block takes literally 15 minutes. And you’ll get some fresh air at the same time, so that’s a bonus. For more ambitious exercising without over-packing, check to see if your hotel chain offers cheap rentals on workout gear. Westin, for example, has a gear partnership with New Balance. For $5, you can rent shoes and clothing for your workout – which means you can pack that extra eucalyptus lotion and skip the yoga pants and sneakers. FOMO is a temptress. It can be hard to resist joining every after-meeting dinner with your coworkers or every game of Scrabble with your brothers. But sometimes the best thing you can do for other people is reconnect with yourself and come back fresh. Excuse yourself for 10 minutes to take a solo trip down Instagram lane – or, better yet, do some deep breathing with an app like Headspace. And if after all this you’re still wiped out at the end of a good trip, don’t beat yourself up about it. There’s no shame in going to bed at 8pm in your own timezone. 1. As long as your weirdness doesn’t extend into severe social anxiety or obscene outbursts (in which case, practice taking some deep breaths before you panic), it can help others feel more comfortable around you. Everyone has a freak flag; they’re often just nervous to fly it. You admitting your fascination with flightless birds may be just what your conversation partner needs in order to let their guard down and connect with you (perhaps even over mutual avian interests). 2. Weirdos get a free pass to have more fun. Love moonwalking down the street to the music coming out of other people’s windows? Just do it. It’ll only take once for you to get a “weird” label and then you can street dance as often as you want without anyone bothering you. 3. According to John Manley of Fast Company, your inner weirdo helps you get ahead at work. His recent article also includes some wonderful commentary about “declaring a minor” in life—a weird or not weird avocation that keeps you stimulated and fosters your propensity for adventurous creativity. 4. In extreme situations, weirdos always prevail. Stranded on an island? The weirdo knows which plants taste like pizza (and won’t kill you). Accidentally erased your harddrive while trying to watch videos of cute cats? The weirdo will have you back in business in three minutes flat. 5. As my mother always says, “to be interesting, you have to be interested.” Showing interest in something unique helps define you as an interesting human being. Showing interest in others unique interests doubles (maybe even triples) your interesting factor and additionally makes you extremely pleasant to be around. Everybody likes a weirdo who asks good questions. 6. Because of your wide-ranging weird interests, you’re able to connect the dots on disparate concepts and come up with creative (albeit not always plausible) solutions. When successful, this ability not only helps you at work (see number 3), it gives you greater appreciation for the community knowledge-pool. You’re more likely to be able to capitalize on someone else’s weird skill when you have a few of your own. 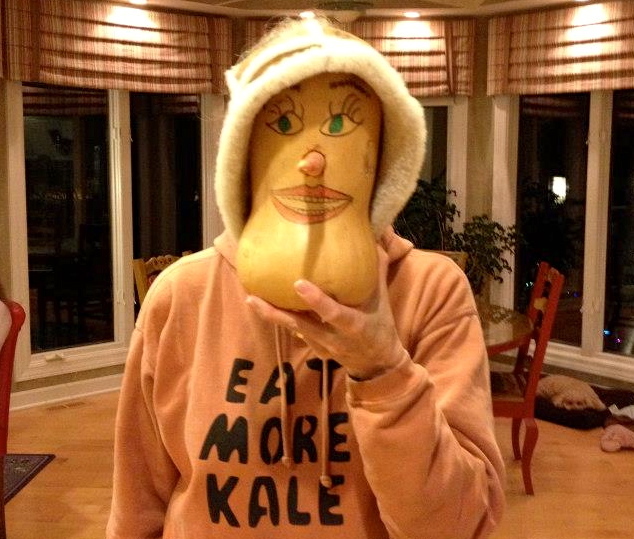 One of my weird family members with a squash head named “Turkita” over Thanksgiving. We clearly had no fun. In my three decades on Earth, I feel really lucky to have had many different jobs in many different fields. I’ve been a grant writer, catering server, adjunct professor, administrative assistant, marketing manager, barista, hotel sales coordinator, yoga instructor, writer, production manager, cleaning lady, lighting designer, babysitter, stage manager, DJ (not so great at the DJing, as it turns out), program coordinator, sales associate and research assistant. Right now, I’m a contract content producer (and I love it). 1. Challenges. Tiny ones, quick ones, long ones and gigantic ones. If you’re not being challenged, your brain is probably dying. 2. Like-minded people. People who understand your satisfaction with a beautifully organized Google doc (for example), and who can empathize with you when things aren’t going quite right. These people keep you grounded. 3. Different-minded people. People who are able to look at a situation from angles you didn’t even know existed and pull metaphorical rabbits out of metaphorical hats. These people keep you on your toes. 4. A way for you to move around and not sit or stand in the same place all day long. Whether it’s a nice outdoor space or a mobile indoor situation in which you can work wherever feels productive, good jobs let you move. 5. Good tea and coffee. And some healthy snacks. Simple pleasures make a big difference. 6. Quiet space where you can focus without distraction. It’s important that you’re able to plow through a problem or a project uninterrupted when you need to. 7. Distractions. Being able to adapt and switch gears based on the needs of the people around you is an important skill that will serve you in all areas of life. You might as well hone it at your job. 8. Laughter. You should be skeptical of anyone who wants to be serious for eight or more hours straight. Human beings are built to laugh. In January, I started a 40-hour/week contract position with a smart, savvy and totally hip (I don’t use that word lightly—this place is hip) digital marketing agency. Working there has really informed how I view good collaboration and healthy work environments. The collection of strategists, creatives and producers working smoothly together and in parallel with each other is pretty amazing. Sure, people get stressed. But it’s the good kind of stress that leaves you in slightly stunned wonder at the end of each day (“How did we possibly get that much done?”). Everyone is allowed and expected to be flexible in his or her role. The strategists come up with copy when the writers aren’t available. Writers create timelines when the producers are on other projects. The producers dig for good imagery when the designers are booked up and the designers are fierce strategists. Everyone defers to the “expert” in the room when one is available, but no one works in a tightly defined box. People laugh. Often. And loudly. All thirty-plus staffers sit at two gigantic tables and work next to and across from each other, so laughter travels fast. People like each other. The agency doesn’t hire employees on a whim. It’s a lengthy get-to-know you process in which cultural fit is highly valued. It’s easy to work with people you like. Since it’s easy, work gets done quickly, efficiently and with minor (if any) pauses to mediate personnel issues. It’s not personal or hierarchical. Since the majority of the work done is on behalf of an outside client, the best idea always wins. It doesn’t matter who came up with it. This type of mentality serves all parties well. The clients are happy with the level of thought and execution put in at all levels of all projects and they continue to send the agency business. In short, it’s a pretty cool and functional place.